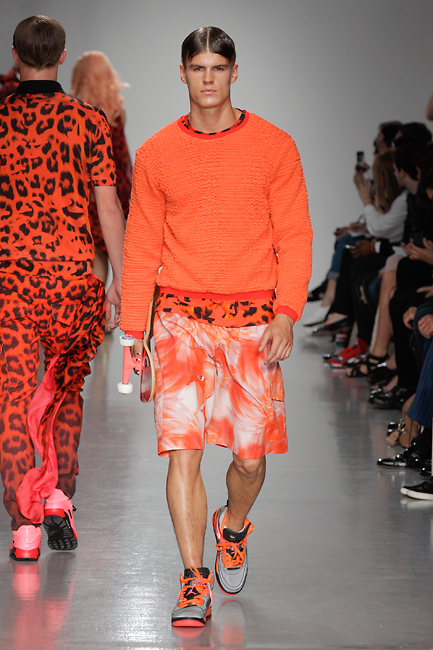 The theme of Katie Eary's Spring Summer 2014 collection was 'Flamingo Massacre' and although hard to imagine what this entails at first, it all becomes clear when you see the vivid colour palette, luxurious fabrics and the use of print. The models walked down the catwalk to a soundtrack of A$AP Rocky and Kanye West transporting the audience to the sidewalks of LA. 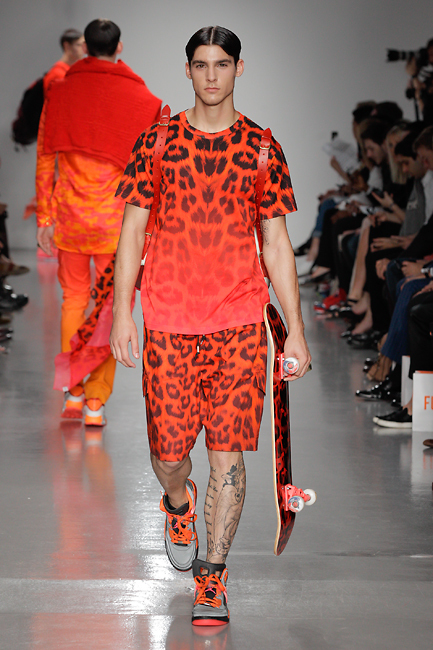 Skateboards printed with Katie's fiery red flamingo feather print were a focal point in the collection, ramping up the cool factor and allowing the finer details in the garments to stand out. Floaty flamingo feather printed kaftans were worn over swimwear printed in pinks and reds by the girls and the boys embodied a haute surf look with blood orange flannel jumpers and oversized printed T-shirts. Katie Eary is appealing to the 'Cool kids on the block' with her statement prints and laid back vibe. Broken down, the looks become a collection of wearable stand out pieces that openly explore the use of print and texture.